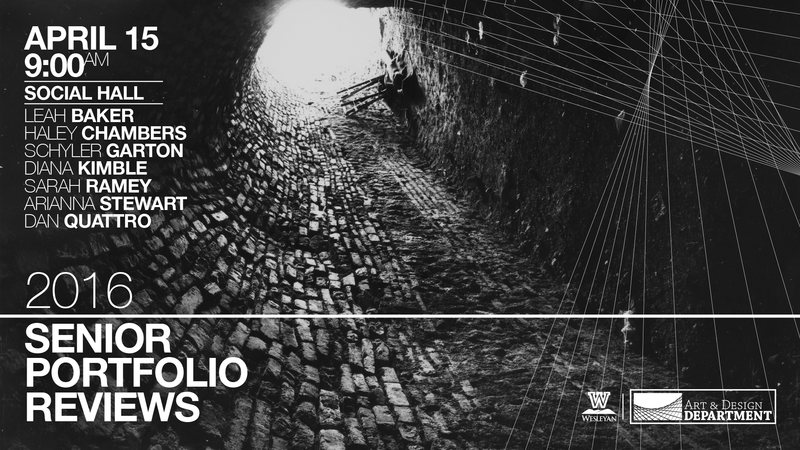 Graphic design and studio artists pursuing commercial / professional practice will be presenting their final portfolios beginning at 8:30am with an open session; students, faculty and the community will have an opportunity to look through each portfolio and speak with the students about their work. Following the open session, each designer and artist will then give a presentation of their work which will be critiqued by a panel of local / regional professionals and practicing WVWC alumni. Each presenter will then receive feedback from the panel in order to further prepare and refine their portfolios before graduating in May. Presenters for 2016 are: Leah Baker, Sarah Ramey, Schyler Garton, Dan Quattro, Arianna Stewart, Diana Kimble and Haley Chambers. Presentations will begin at 9:05am and each will last approximately 10 minutes. Each presentation will be followed by a 15 minute critique and question and answer session with the panelists. Admittance will be limited during presentations, so please plan accordingly. Posted in Announcements, Events, News.